Abstract - In this paper, we propose a flow-level simulator called FSIM (Fluid-based SIMulator) for performance evaluation of large-scale networks, and verify its effectiveness using our FSIM implementation. The notable feature of our flow-level simulator FSIM is fast simulation execution compared with a conventional flow-level simulator. For accelerating simulation execution speed, our flow-level simulator FSIM adopts an adaptive numerical computation algorithm for ordinary differential equations. Another features of our flow-level simulator FSIM are accuracy and compatibility with an existing network performance analysis tool. For improving simulation accuracy, our flow-level simulator FSIM utilizes accurate fluid-flow models. In this paper, through extensive experiments using our FSIM implementation, we evaluate the effectiveness of our flow-level simulator FSIM in terms of simulation speed, accuracy and memory consumption. Consequently, we show that our flow-level simulator FSIM out-performs a conventional flow-level simulator; i.e., it realizes ap-proximately 200%-2,000% faster simulation with higher accuracy and less memory consumption than a conventional flow-level simulator. Abstract - This paper presents an ontology-driven decision support system for Syrian Wheat production. Wheat is the most important staple food commodity in the country and is consumed primarily as bread. It is also the country�s only strategic food security commodity, and is treated accordingly. This paper also aims to develop criteria for Wheat production ontology and concentrates on Wheat diseases, control methods, Wheat issues and strategies. Rule-based reasoning system and ontology proved to be able to cope with some difficulties and to face several problems related to Wheat domain. The developed ontology would be a knowledge base and a role stone for advanced research knowledge management in Wheat domain. Moreover, it is so important for the decision makers to know the opportunities to capture them and to avoid the threats that could negatively affect the Wheat production. Abstract - This paper presents a simple method that dealt with independent component analysis and Finite Impulse Response (FIR) filter in separating convolutive mixtures. The original source was retrieved from the set of filtered versions of each mixed signals using independent component analysis method as well as filtering mixture of voices (audio) recorded in a noisy environment. 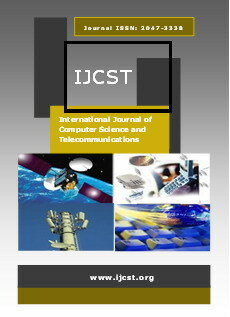 Abstract - In modern world, network technology has witnessed a great progress. The enterprise networks are now being connected to public internet to benefit from it and to increase their business productivity. Internet Service Providers provide high bandwidth connection to enterprise to connect all of its sites, however a disconnection for any reason with the service provider can be disastrous for enterprise. Clever business enterprises always make sure that they have a backup connection to keep all of their sites connected in case of any loss of connection to the main service provider. In this research work we address the issues related to redundancy between the business sites running OSPF routing protocols as their internal routing protocol and BGP on the MPLS based service provider network. For quick implementation and better understanding of readers, the proposed network design is implemented with Dynagen Simulator. The research work aims to provide some helpful guidelines to students and network engineers on redundancy in scalable enterprise networks. Abstract - The volume of information resources potentially available in the globe is massive; hence it becomes necessary to examine available information resources for academics research activity in the academia. This study, therefore, examined the perception of academics on availability of information resources for research productivity in federal universities in Nigeria. Descriptive survey research design was adopted. The Multistage sampling technique was used to select 1,057 academic staff members from twelve federal universities in the six geo-political zones of Nigeria. The categories of academic staff covered in the study were from professorial cadre to graduate assistant. The instruments used for data collection were: Availability of Information Resources (r= 0.69) and Research Productivity of Academics (r=0.91). Eight hundred and seventy-three copies of the questionnaire were used for analysis. Data were analyzed using descriptive statistics, Pearson Product Moment Correlation Coefficient. There was no significant relationship between availability of information resources and academics research productivity. The mean score of information resources availability was adequate in Nigerian federal universities libraries ( x'=2.41; SD = 0.90) which means that information resources were readily available to academics for research productivity. To further sustain academic staff research productivity, librarians should organize continuous awareness program on availability of information resources to increase research productivity of academics. Abstract - WiMAX IEEE 802.16 is stated as worldwide interoperability for microwave access intended to facilitate the interoperation and adaptation of wireless MAN. WiMAX is capable of providing high data output and low delays in different modes of operation. For these reasons WiMAX is useful in organizational and end-client structures. Before the last upgrade in the standard of WiMAX i.e. privacy and key management version 2 (PKMv2) WiMAX was not considered fully secure. The standard cannot handle the security threats associated with MAC and physical layers even after mutually authenticating the base station and mobile station. There are two objectives for WiMAX security, first is to improve privacy over the wireless link and second obligation is delivering access control effectively to the network. To achieve these objectives a better key management scheme and effective security model of WiMAX must be designed. From security perspective the Identity Based Cryptography (IBC) has advantages in improving the security and effectiveness of the standard. Little research work has been devoted in a complete and competent security solution. Objective of this thesis is to handle different security issues like replay attack, man in the middle and denial of service, implement the security protocols and algorithms using OMNET++ simulator. Different security algorithms are implemented together to enhance the existing security protocol. Every attack is partitioned according to its type, its likelihood and its impact on the system so the protocol is implemented to deal with these attacks accordingly. Abstract - Signatures are one of the most important and commonly used tools for human identification. This paper proposes an offline signature verification method based on texture analysis of the image. A sample of signatures is used to represent a particular person. For each known writer sample of fifteen genuine signatures are taken. Forged signatures are also used to test the efficiency of the system. For each signature gray level run length matrix features are extracted and the inter-class distances and intra class distances have been calculated. For each test signature the intra-class threshold is compared to the inter-class threshold for the claimed signature to be verified using Euclidean distance model. Results showed that signature texture feature can be reasonably used for personal verification. Texture based feature extraction technique consistently outperformed the traditional grid based feature extraction technique. Accuracy of 85% was achieved with the Euclidean distance classifier with FAR and FRR as low 13.33% and 16.4%.